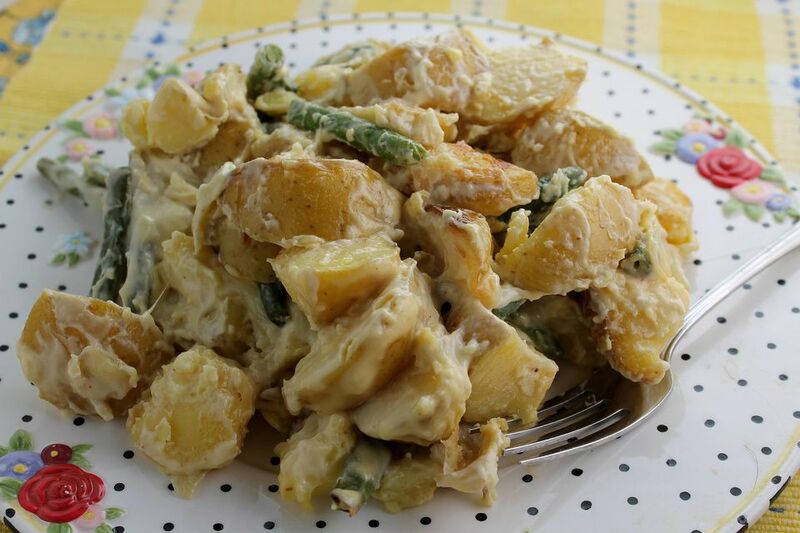 This recipe for Roasted Potato and Green Bean Salad is delicious. Yukon Gold potatoes, first of all, are buttery and rich, especially when roasted, and I now think they are a better choice for roasted potato salads than russet potatoes. The green beans are tender and very flavorful when cooked this way, and the dressing is rich with mustard and lemon. You could add more vegetables to it if you'd like, but I think it's perfect this way, on its own. The recipe really doesn't need herbs, but add some fresh chopped basil or thyme when you fold in the cheese for another hit of flavor. You can add chopped cooked chicken or ham to this salad to turn it into a main dish, or eat it as a vegetarian entree. Or serve it as a side dish to any roasted or grilled meat. It's also perfect on a picnic. It would be fabulous with meatloaf in the winter. Or just make a batch and keep it in the fridge and let the family eat it until it's gone (this won't take long!). Preheat oven to 400°F. In a large roasting pan, combine potatoes, onion, and garlic. Drizzle with olive oil and toss to coat. Spread the vegetables in an even layer. Roast for 40 minutes, then carefully turn the veggies with a large spatula. Return the roasting pan to the oven. Roast for another 15 minutes, then top with the green beans. Roast for another 15 to 20 minutes or until potatoes are tender when pierced with a fork and green beans are crisp-tender. While the vegetables are roasting, in large bowl combine mayonnaise, yogurt, honey mustard, and lemon juice and mix with a wire whisk until smooth. When the vegetables are done, add to the mayonnaise mixture in batches and stir gently to coat. Stir in the cheese until everything is coated. Cover and refrigerate for 2 to 3 hours to blend flavors before serving. Store in refrigerator.